Hi. Remember us? We’re Generation X. People used to call us “the MTV generation.” They also used to call us lazy. And slackers. And unmotivated. Oh, and we were also going to ruin the world. Or, at least, that was the impression we got. The good thing was, most of us were too lackadaisical to care. If you haven’t noticed yet, we were also very sarcastic. It’s 2015 now, and you don’t really hear much about us anymore. The world seems to still be spinning on its axis, so we haven’t managed to screw things up beyond repair – yet. Most of us got jobs doing something or other, so we didn’t all starve to death in our parents’ basements. In all honesty, though, I’m not really sure what we’re up to these days. We seem to have disappeared altogether sometimes. 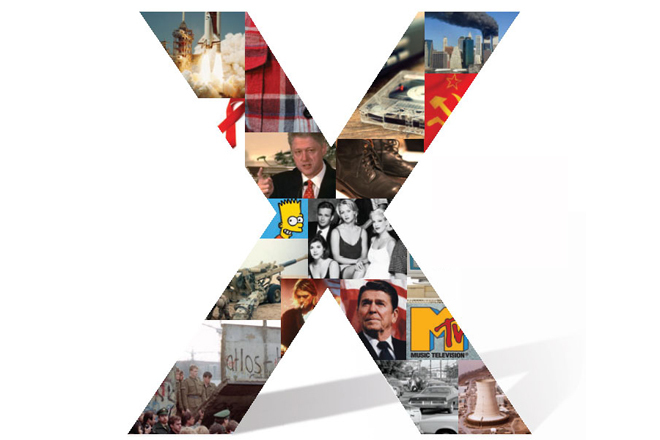 As a 41-year-old, I have both feet planted firmly in the generation that was defined by the most generic of letters – x. To be honest, being a Gen X’er kind of sucked. Granted, much of my perception of growing up in this generation was clouded by a depression-induced haze, but I don’t remember a great many positive things being said about us. Richard O’Connor, author of the book Undoing Depression: What Therapy doesn’t Teach You and Medication Can’t Teach You, theorizes on his website that much of the cynicism of Generation X comes from being “lied to all their lives.” I believe it could just as well have come from too much negative reinforcement. All of the focus these days, though, is on millennials. If Generation X had no expectations placed upon it, millennials have the weight of the world bearing down on them. It is little surprise, then, that San Diego State University psychology professor Jean Twenge, author of Generation Me: Why Today’s Young Americans Are More Confident, Assertive, Entitled – and More Miserable Than Ever Before, reported in October of last year that millennials may actually be more depressed than their Gen X counterparts. To once again make use of my generation’s witty sarcasm, even if we didn’t accomplish much, at least we didn’t get stressed out doing it. In all seriousness, though, millennials seem to be facing the exact opposite problem Gen X’ers faced. One generation didn’t seem to have many expectations of any kind place upon it; the other seems to be expected to save the world tomorrow. I believe the common denominator both of these generations is lacking is hope. Generation X was told to not have a lot of hope; millennials face a bar that is so high, they have no hope of achieving it. I’m obviously speaking in broad generalizations here, of course. Not everyone in the last two generations is devoid of hope. What I am referring to is more of the climate surrounding each one. Think of the generation which preceded mine – the Baby Boomers. This was a generation which believed in “the system,” embraced optimism, and witnessed the world change through events such as World War II and the civil rights movement. Now, perhaps some of that optimism was misplaced (as we Gen X’ers found out later), but it provided a firm anchor for Boomers to hold on to. Could the dimming of this hope be the reason that depression rates seem to be on the rise with each generation? Are we actually fueling the fire of our own problem? On second thought, maybe being part of Generation X wasn’t so bad after all. We at least had the opportunity to fly under the radar and make our own ways, and whatever we accomplished we could wave in the faces of our detractors. We saw through the system, and we carved out our own identity. Millennials seem to have a tougher row to hoe these days. Sometimes it seems as if whatever they accomplish won’t ever be enough. I hope the next generation – whatever we choose to call it – is able to turn the tide on depression and anxiety. Gen X will be watching … from over here … out of the way. ← Should You Be Ashamed Of Your Mental Illness? Nothing happened to Generation X. At between 81-87 million we are the largest generation in U.S. history. We have an individual spending power that is 6 times that of Millennials. We birthed the Internet and alternative energy. We are doing just fine. I am also 41 years of age and feel like I’ve fallen in a generational crack that is Gen-X. I find it truly sad how every generation alive today, starting with us, has little hope for the future. And I can’t help but be pissed off that our parents knew the kind of world we would be born into and did it any way. I keep plugging away and sit on the sidelines watching the Boomers and the Millennials duke it out in the job world with no mention to the quiet efficiency of Generation X.
I too am an X’er. To the generations that bookend us I say put thumb in the eye of the self-important boomers, and offer a cautious helping hand to the milenemials who at least recognize our generational existence.